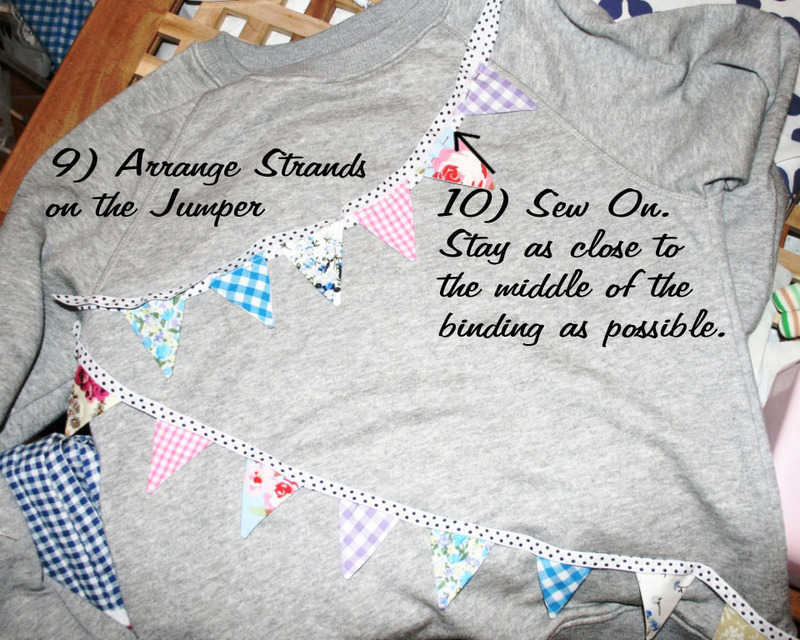 Well here it is… I tried to take photos along the way to make a tutorial of how to recreate the bunting jumper. I hope the instructions will be good enough for you to follow. 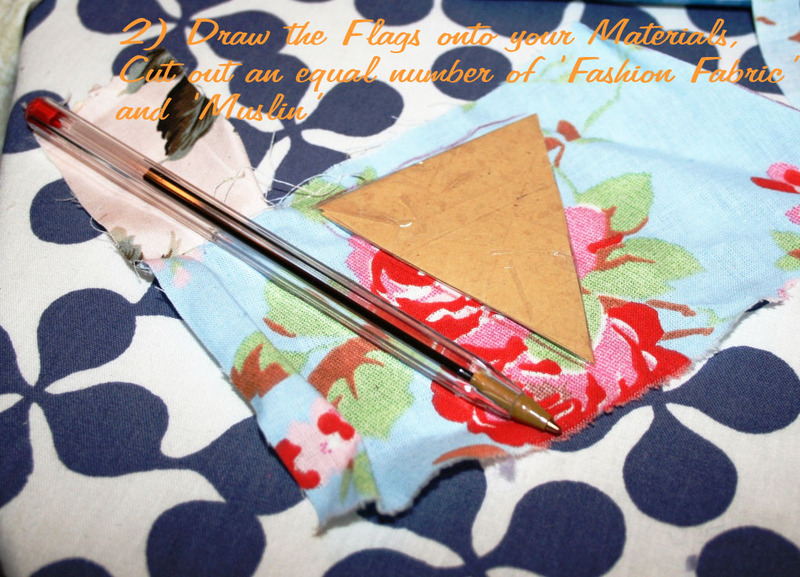 First things first, decide what materials you would like your flags to be made out of. Most of ours were made out of scraps of materials from other projects. You could have all your flags out of the same material or alternate between two kinds, or do as we did and make them all different. 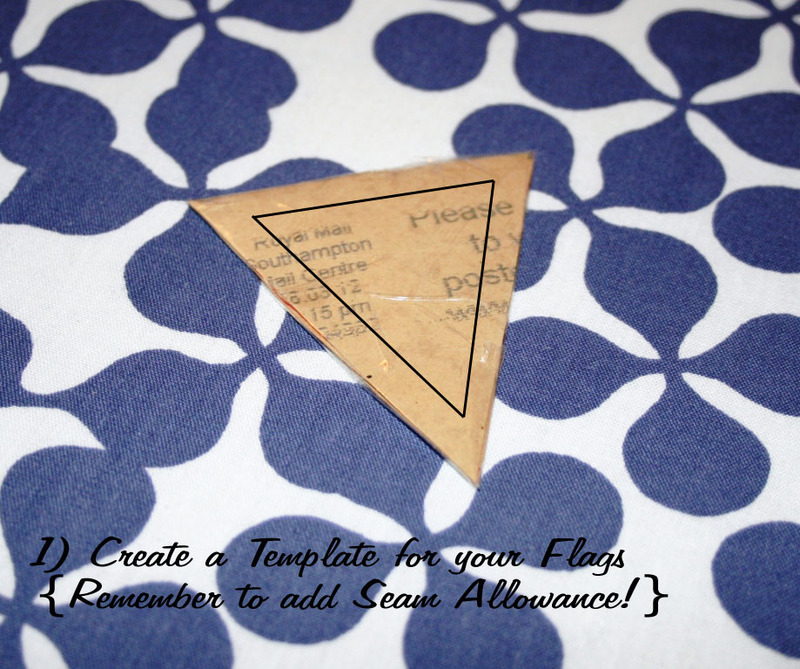 Decide what size you would like the triangles to be and create a template including seam allowance (use what ever size allowance you are used to dealing with). I used two layers of an envelope and covered it in tape to make it a little thicker. 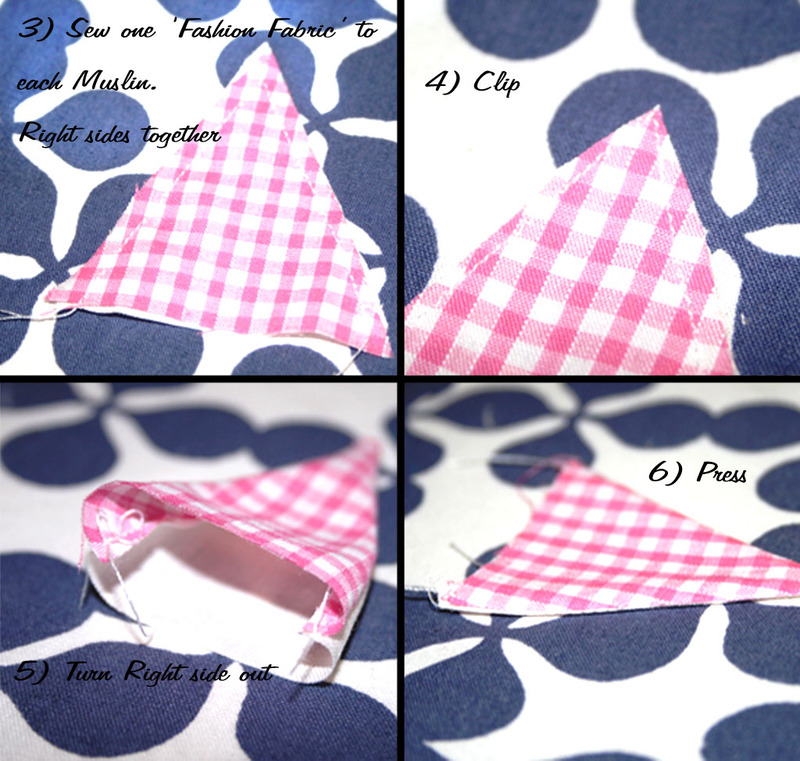 Use this to cut out the number of triangles you want to place on your top from the front materials and the same number out of a cheap muslin like material. Turn the flag the right side out and use a pointed implement to make sure that the point is fully turned out. We used a pen with its lid on, but something like a knitting needle would work equally as well, if not better. Press the flag flat with a hot iron. And repeat for the rest of your flags. We had a good little production line going with me sewing and Nikki turning them the right way out and ironing them. Once you have a neat little stack of flags you need to decide how far apart you want them on the ‘rope’. For ours we had a lovely polkadot bias binding. The flags were situated a little under half a flag width apart. 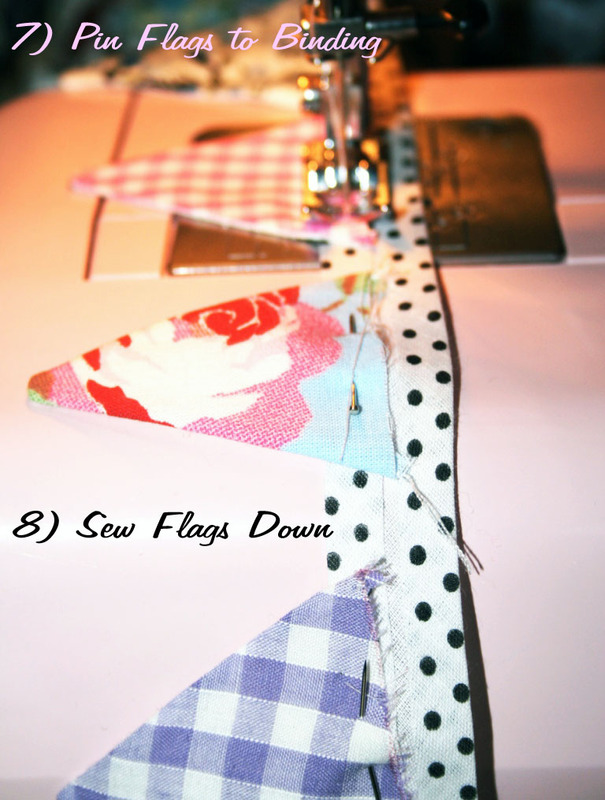 Pin the flags to one half of the bias binding and check that you are happy with their placement, that non of the colours clash and that you don’t have too many of one colour scheme in a row. Then sew along the binding to secure the flags to one edge of it. When the binding is closed the open end of the flag will be sandwiched in the binding so that there are no raw edges. 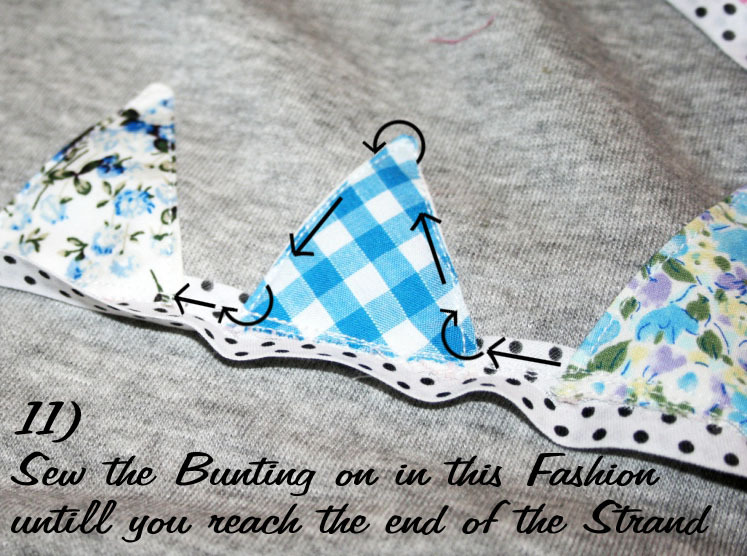 You now need to work out where you want your bunting to be on the jumper. We had one strand running across the top at a slight angle and then the other running across the remainder of the space. Once you know where the flags are going pin the binding down to the jumper, keeping it open so that you can sew it to the jumper and it will be hidden. 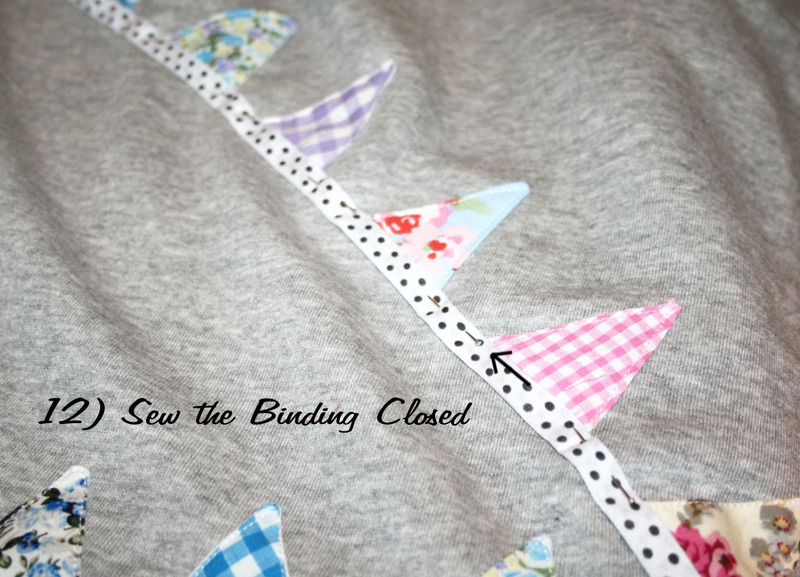 Sew along the bunting as close to the fold as possible, when you close the binding this will prevent the top of it peeling away from the top with wear. 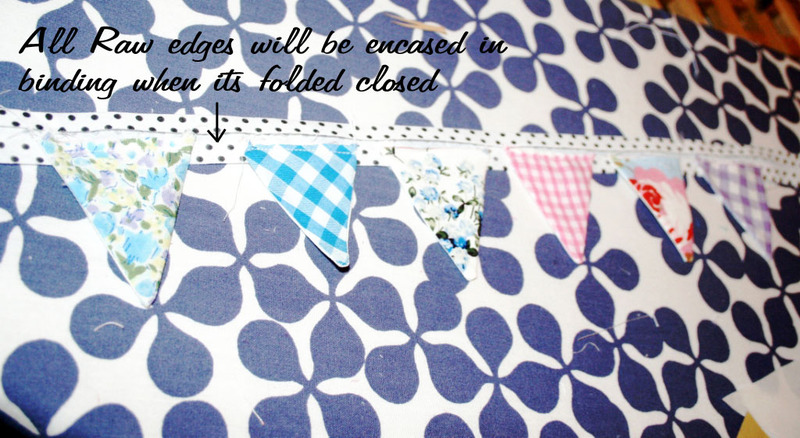 Now sew along the bunting and around the perimeter of the flags to attach these to the top. Then once this is finished sew the binding closed, as close to the edge as you can. This is too darn CUTE!!!! This is adorable! 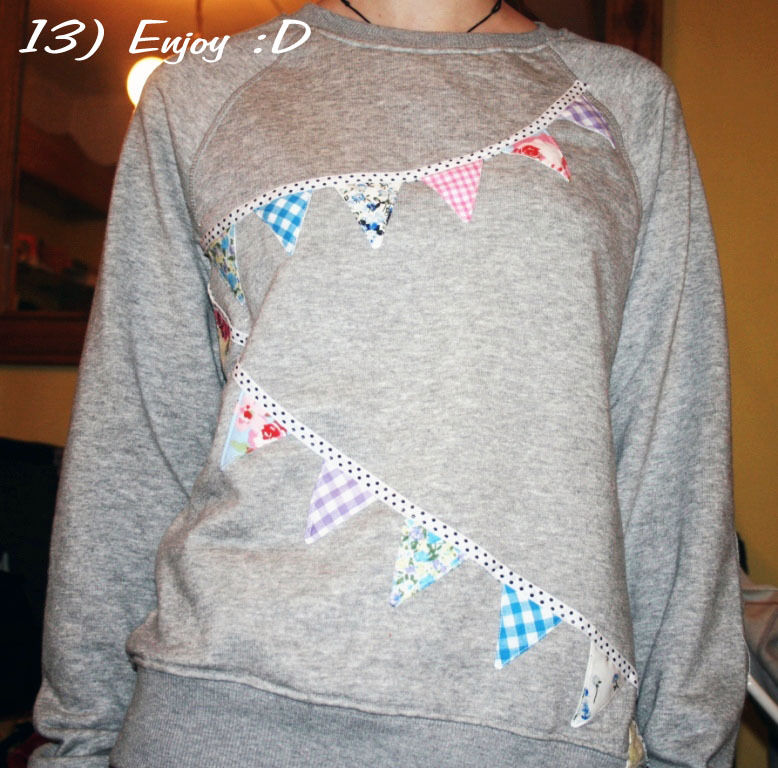 I love sweatshirts, and the way you decorated it is too cute!